Is that Currency Overvalued? Check the Big Mac Index! Twice a year, The Economist puts out its Big Mac Index. This is an index developed in 1986, and meant to help compare exchange rates around the world. The idea behind the Big Mac Index is that it takes something that is prepared virtually the same way around the world, and uses it as a comparison. What a Big Mac costs in one country as compared to another could very well indicate which currencies are a bit overvalued, and which are undervalued. Below is a video from Travelex explaining how the Big Mac Index works. As you can see, the Big Mac Index is far from perfect. Any economic indicator is going to have its flaws, and the Big Mac Index is no exception. Even though Big Macs are the same thing in most countries, the cost to produce them differs according to a number of factors. Everything from the cost of the ingredients to what McDonald’s pays workers in different countries has to go into the equation. And the Big Mac Index just doesn’t account for that. It simply looks at the cost of a Big Mac in each of the countries in question, and then draws a few conclusions based on that information. So, does that mean the Big Mac Index is completely useless? Even though The Economist admits that the Big Mac Index is more of a lighthearted attempt at a market indicator, there are still those that take it very seriously. Academic studies have been based on the Big Mac Index. On top of that, just like any indicator, this index can provide insights into overall trends. In this case, long-term currency trends can be discerned with the help of the Big Mac Indicator. And, as the video points out, it’s possible for world travelers to use the index for comparing possible price differences around the world. If you can see that a Big Mac costs the equivalent of $6.81 in Western Europe as compared to it costing $4.20 in the United States, you can assume that many other consumer items are going to cost more when you go to Europe. Contrast that with the fact that a Big Mac costs the equivalent of $1.62 to India. If you are planning a trip there, it’s a fairly safe bet that your dollars will go further than they would here in the United States (and certainly further than they would in Europe). Using the Big Mac Index is kind of fun, sort of like how using the “lipstick” economic indicator can be a fun way to gauge where the economy might be headed. It’s not entirely serious, but it does provide a consumer-based look at where currencies stand, and where the forex market might be heading as it relates to certain currency pairs (remember that each pair has its own direction). What do you think? 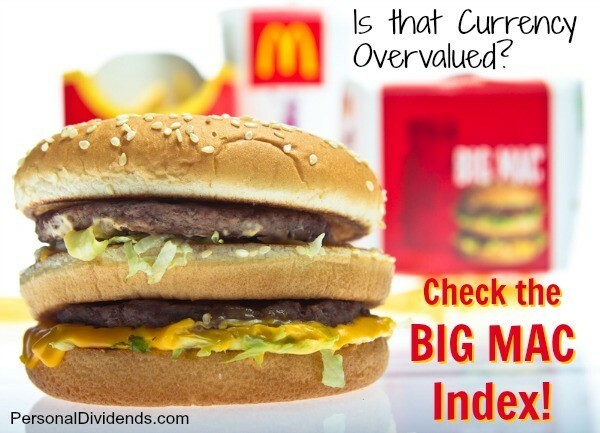 Is the Big Mac Index legit? What indicators do you think offer helpful clues about where markets and economies are headed?